I Need Geography: Smoking or Non- Smoking? A Biology student might be interested in what smoking can do to your lungs. 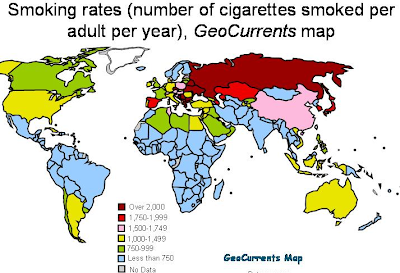 A Geography student would want to know where do people smoke the most and least. A Geography student would want to dig deeper and ask "why there?" What environmental and social conditions would lead people to smoke tobacco and ensure access to it? How do people in different cultures view tobacco use? Why are people in certain areas less likely to use tobacco? That is what the folks over at Geocurrents wanted to know, so they found some data, mapped it and then explained their findings in an article you can read here.